What are the ways to make a form either advance or recede? In the first post with its focus on Turner, I discussed the importance of the direction a subject faces and its placement in the overall composition when portraying movement. The following discussion revisits this concept and introduces some additional principles relating to the depiction of advancing and receding forms. Let me begin by returning to the idea that the direction a subject faces is an important consideration when portraying movement. Rather than rehashing the issues previously addressed with Turner regarding sideways movement, I now wish to propose principles for representing movement by shifts to either the left or right direction of advancing and receding forms. The principle behind achieving the illusion of advancing forms by the direction they face—and this is only one of a number of visual devices (i.e. tricks) that I’ll be discussing—is as simple as saying “advancing forms should face towards the right side of the image.” Conversely, for receding forms “they should recede towards the left side of the image.” These complementary principles are simple to say but the question as to whether they work as convincing illusions in practice can only be shown by demonstration. 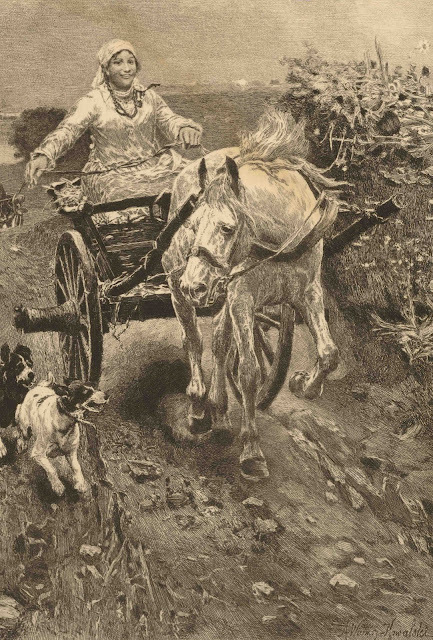 Compare, for example, the advancing horse-drawn cart in F Dielman’s etching, Merry Morning, after a painting by A Wierusz-Kowalski with the receding horses in Veyrassat’s Two Horses (shown below). 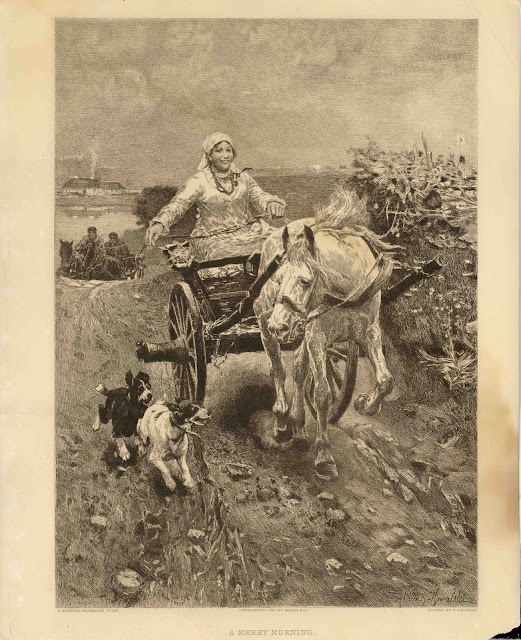 Published by Gebbie & Co. Condition: The print is a strong impression but there are condition issues. There is a nibbled lower-right corner and a diagonal crease on the upper-right corner. There is a light water stain diagonally stretching from top-left to lower-right. I am selling this print for $54 AUD including postage and handling to anywhere in the world. Please contact me using the email link at the top of the page if you are interested or click the “Buy Now” button. Condition: Crisp impression and in pristine condition. I am selling this print for $167 AUD including postage and handling to anywhere in the world. Please contact me using the email link at the top of the page if you are interested or click the “Buy Now” button. From my viewpoint, Wierusz-Kowalski and Dielman’s horse and cart advancing to the right suggests unconstrained flow, as any movement in this direction matches my left-to-right reading direction that ultimately leads “out” of the print. 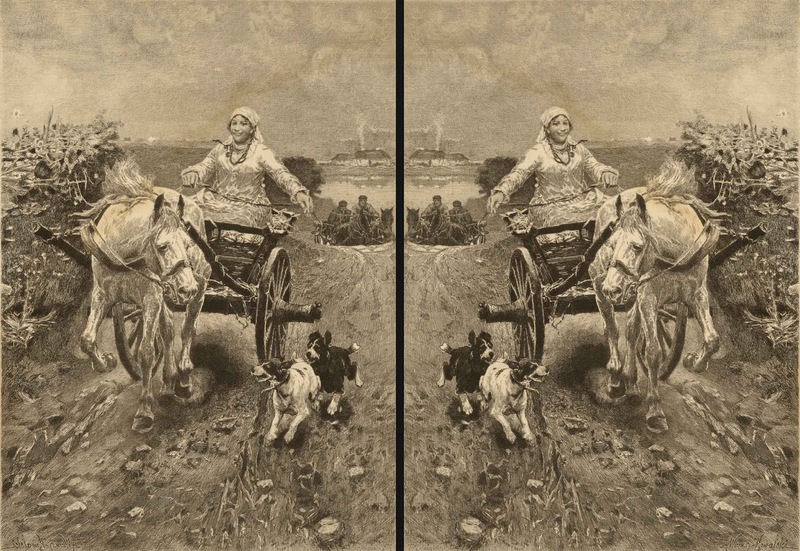 If this image is mirrored so that the same advancing party moves to the left instead of the right (see below) then my perception of movement is constrained, as my left-to-right reading direction metaphorically “fights” with the flow of movement portrayed in the image willing the horse and cart to change their direction. Needless to say each viewer may have a different response to the mirrored images but if my reading is shown to be true than there is validity in the principle. To help clarify the validity of this principle, Wierusz-Kowalski did many paintings of advancing horses and in the video clip below the question as to which direction is more appropriate for advancing forms may be tested further. If I may now turn to Veyrassat’s receding two horses, the direction in which they travel diverts my left-to-right reading to look pictorially into the image. This adjustment to where I look is very different to the “fight” against the flow of my eye as is the case with the mirrored Merry Morning. There is a more fundamental approach to suggesting advancing or receding movements and it is often used in cartoons: for an advancing form, the middle area of its front surface should be portrayed in focus and the form’s silhouette outline blurred. Conversely, for a receding form, the middle area of its front surface should be portrayed as blurred and the form’s silhouette outline in focus. 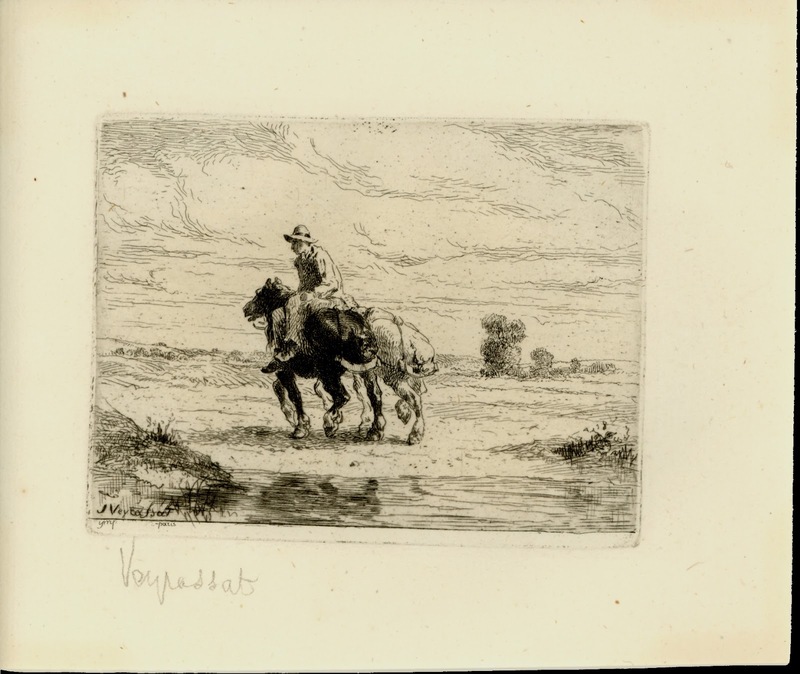 Veyrassat’s etching is a fine example of how this approach works in a practical application for receding forms. 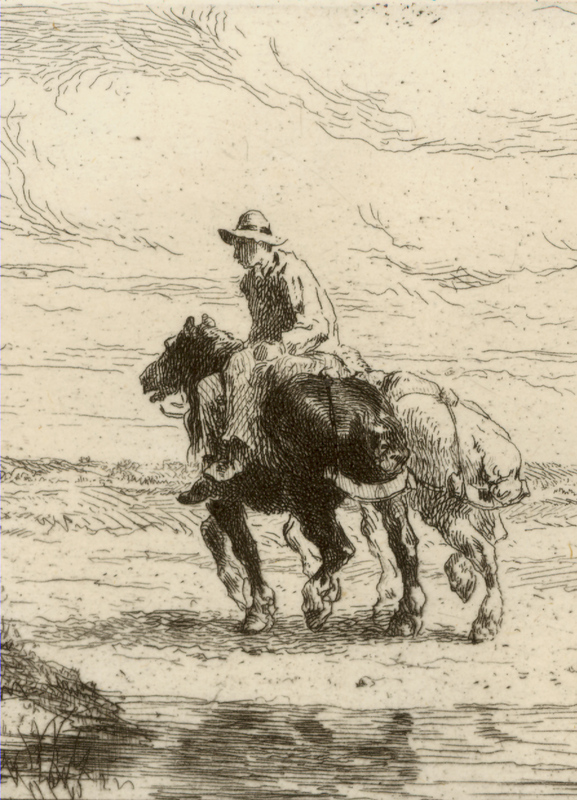 Here the middle of the front plane of the two horses—their rumps—is much harder to interpret as horse backsides and yet the horses’ clear silhouette outlines makes their receding direction easy to see. With regard to Dielman’s advancing horse there is a problem: the whole horse is in focus and there are no features that are focally blurred. 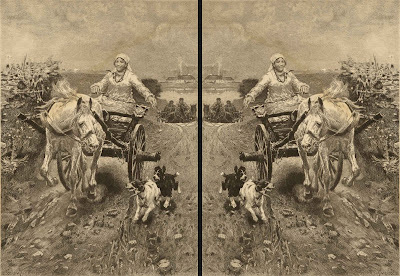 To demonstrate what would happen if the outer edges of the horse were blurred while the middle area were in focus, the digitally exaggerated altered image below may be revealing. 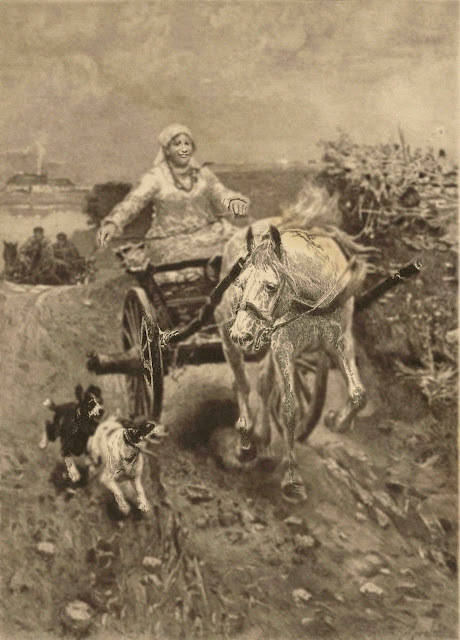 An important variable in the representation of advancing or receding forms is the speed that they are travelling. Certainly variations of colour from strong contrast of advancing warm colours (e.g. orange and red) and receding cool colours (e.g. blue and green) can play a significant role as can the variables of chroma (i.e. the degree of colour intensity), opacity, sheen and the attributes and placement of the marks used (e.g. agitrons/animation marks or effects mimicking second-curtain flash photography). But there is another more subtle and simple principle for portraying very fast moving forms and that is to portray the form as being top heavy. In this regard Dielman’s etching is a superb example. In a future posts I will build upon this use of unstable balance to connote movement as it is part of a rich and interesting field of visual illusions that artists have employed.